He is the most learned scholar and Sufi: Ibrahim bin Ismaeel bin Muhammad Siddiq bin Muhammad Hasan al-Yaqubi al-Hasani al-Jazairi, then al-Dimashqi. The origin of his family returns back to the Algeria. His great grandfather Sh. Muhammad al-Hasan migrated with his family as part of the famously known ‘Migration of the Scholars’ (Hijrah al-Mashaikh) during the middle of the thirteenth Islamic century, along with Sh. Muhammad al-Mahdi al-Saklawi and Sh. Muhammad al-Mubarak al-Kabir. His grandfather reached Damascus in the year 1263 Hijri. Adapted from ‘Nathar al-Jawahir wal-Durar’, any corrections are as always welcomed. how can you not love this man!!! subhan’Allah. It just makes me think that did such a man exist and we missed the chance of meeting him. 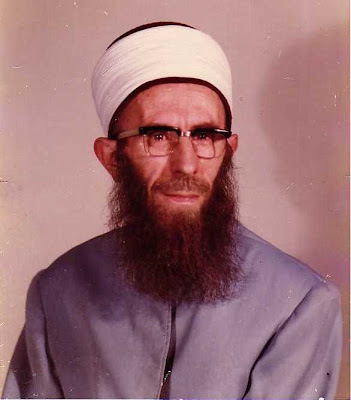 May Allah have mercy on the Shaykh and bless his son Sayyiduna Shaykh Muhammad al Yacoubi.